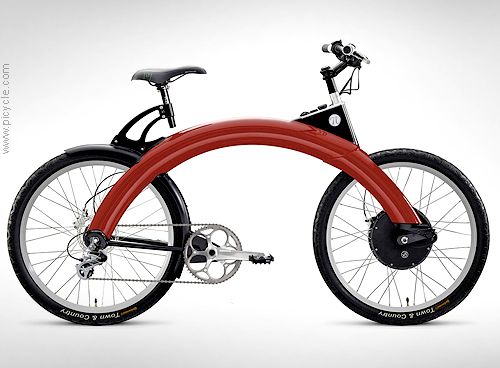 PiCycle™ Sport Touring electric bike. The PiCycle™ is a 7 speed electric bicycle powered with a lithium-ion battery pack, isolated within the arch monocoque frame, that can propel the bike about 32 Km on a single charge. A 36-volt 750W brushless DC motor takes the performance up to 32Km/h top speed and a 18% grade climbing ability. Other features include: chain drive with eccentric bottom bracket tensioning, fully adjustable front suspension, disc brakes, double wall aluminium rims and gel saddle and grips. I'd like it better if peddaling charged the batteries - then it would be really ecological.